Louisville, KY (February 17, 2015) – Kentucky Farm Bureau’s (KFB) volunteer leaders continue the organization’s grassroots policy development process this month as they head to Washington, D.C., with their list of 2015 national priority issues and a willingness to serve as “The Voice of Kentucky Agriculture.” The group, consisting of more than 280 KFB members from 64 different counties, has scheduled a series of strategic discussions with Kentucky’s Congressional Delegation during the last week of February to examine issues facing agriculture and rural communities in the Commonwealth. 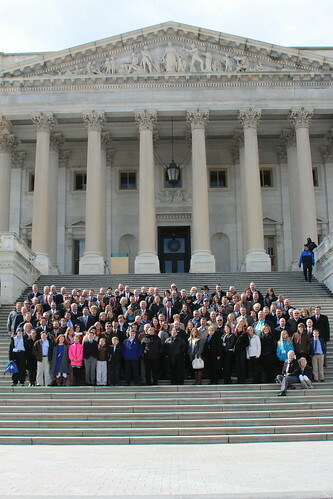 Kentucky Farm Bureau volunteer leaders posed for a group photo on the steps of the nation’s capitol during the organization’s 2014 Congressional Tour. County leaders will be briefed on the current political environment in Washington by the staff of KFB and American Farm Bureau Federation on Monday, February 23. As the group prepares to meet with its Congressmen and Senators the following day, Sharon Bomer, Assistant U.S. Trade Representative for Ag and Commodity Policy, and Brad Bortner, Chief of the Division of Migratory Bird Management for the U.S. Fish and Wildlife Service, will also provide updates relevant to some of KFB’s priority issues. Bomer will discuss the importance of free trade for agriculture and the Trans Pacific Partnership (TPP), and Bortner will address black vulture depredation. A full day of interaction with Kentucky’s political leaders in Washington, D.C., begins at 7:30 a.m. on Tuesday, February 24, with a breakfast at the Grand Hyatt Washington. Both of Kentucky’s U.S. Senators – Mitch McConnell (R) and Rand Paul (R) – and all six of the U.S. Representatives from Kentucky – Andy Barr (R), Brett Guthrie (R), Thomas Massie (R), Hal Rogers (R), Ed Whitfield (R) and John Yarmuth (D) – have the opportunity to address the KFB group during the breakfast, offering updates on the work being done in our nation’s capitol. KFB’s delegates will have the opportunity to directly share the interests of Kentucky’s rural and agricultural livelihood with their elected leaders after the breakfast. “Our Congressional Tour not only provides Kentucky Farm Bureau members with a deeper understanding of the inner workings of Washington, but it also allows them to share their concerns about how the decisions and policies made in D.C. impact agriculture and rural life back home,” said Cain. Each of Kentucky’s Congressmen have reserved time to meet individually with the KFB leaders from their home districts after the KFB breakfast. Senators McConnell and Paul will also reconvene with the group later in the day for a question-and-answer session and a lengthier discussion on their work and efforts in Washington. Cutline: Kentucky Farm Bureau volunteer leaders posed for a group photo on the steps of the nation’s capitol during the organization’s 2014 Congressional Tour.